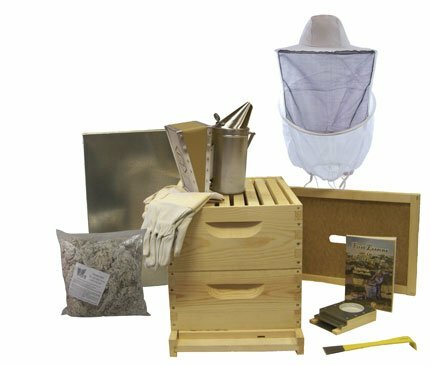 Everything is included in this kit to get your first hive started, except the bees. Having everything come in one box is a huge advantage – a lot easier than purchasing all these items individually. The beehive boxes are made of quality materials and everything is pre-cut, you just need to assemble. Having a rubber mallet and a hammer handy during assembly would be a good idea, though it’s not specifically mentioned in the instructions. The smoker, gloves, and tools are also good quality items that you could purchase individually online or at your local shop. Again, the biggest advantage here being that if you’re just getting started everything comes in one box with this kit. While the kit is all inclusive for the hive building components, you will need something to keep the box up off the ground a bit. A platform of any kind will work fine, whether you build a base out of wood or just put it up on top of some bricks or cinder blocks, you just want to avoid sitting the box directly on the ground. You can easily expand on top of this starter-hive later if you want to or need to, just make sure that you purchase 8-frame boxes. Generally speaking the hive boxes come in 8-frame and 10-frame sizes and these are 8-frame, so if you want to stack them on top of each other stick to that size. The booklet that’s included with this starter kit is perfectly alright, but the Beekeeping For Beginners covers things a bit more. No booklet or course is ever going to be the be all end all of beekeeping, so I like to be open to new learning resources and different ways of thinking. 1 – Smoker fuel 1 lb.